An innovative, technologically advanced option from Modernfold enables transformation of Acousti-Clear® Glass Panels from clear to opaque - and back - with one touch of a button. See attached photos for a MorphGlas™ installation showing how the touch of a button changes glass in an Acousti-Clear® panel from opaque to clear. MorphGlas™, a new, innovative, technological advancement option from Modernfold, offers powerful capabilities in design, convenience, and safety within their Acousti-Clear® acoustically-rated movable glass wall product line. MorphGlas™, a polymer-dispersed liquid crystal product, enables users to create a unique, highly capable showpiece installation by instantly converting from clear to opaque – or back – at the touch of a button. 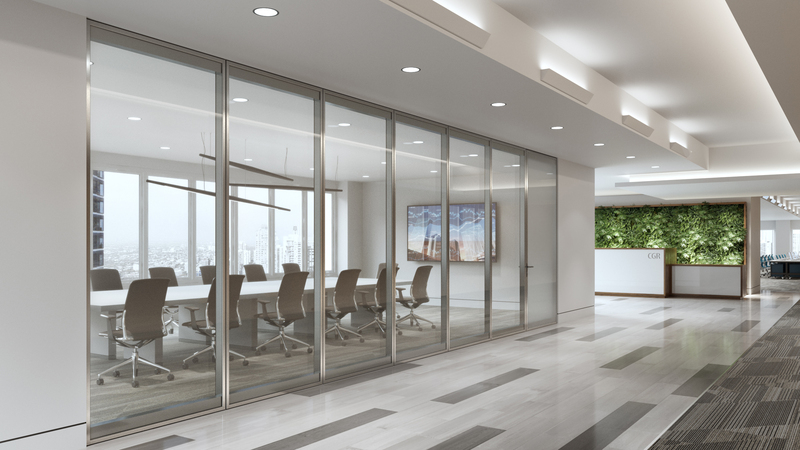 The unique ability to provide acoustical control of 45 STC and now instant privacy, makes Acousti-Clear® and MorphGlas™ the perfect tandem for office, school, or any other environment where space division, flexibility, daylighting, and acoustical control are desired. Fast and simple, MorphGlas™ is offered as a new option in Modernfold’s Acousti-Clear® Motorized product in addition to that line’s existing motorized Venetian blind option. The transition from clear to opaque glass, enabling the switch from clear visibility and daylighting to full privacy, is practically instantaneous when the control button is pushed. MorphGlas™ is just one of many features available with Acousti-Clear®, including motorized venetian blinds that can be raised, lowered, or simply tilted. In all these low voltage options, the simple use of a button provides privacy when needed and full daylight when not. 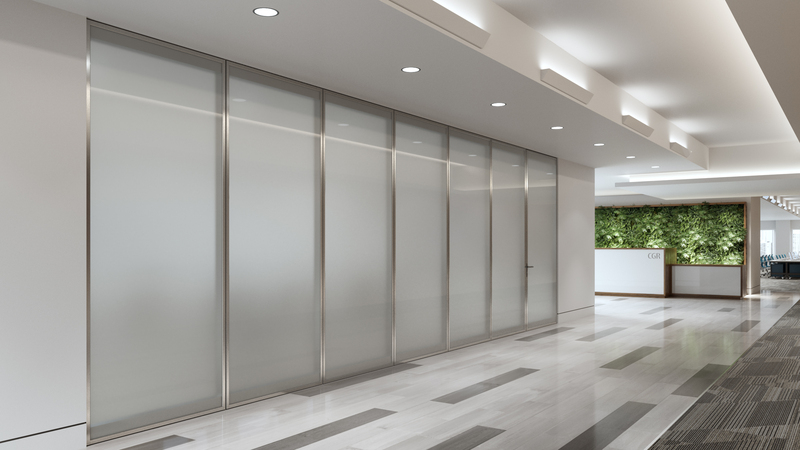 With safety an essential concern in many facilities today, UL® listed MorphGlas™ enables an important safeguard in Modernfold’s Acousti-Clear® Protector Series. Like all products in the line, MorphGlas™ allows facilities to utilize movable walls that provide daylighting, acoustics, and overall flexible space without compromise of safety features. Acousti-Clear®’s line-of-sight deployment system allows users to push a single button and automatically activate MorphGlas™ or deploy blinds within Acousti-Clear® movable walls to quickly and efficiently eliminate sight lines in an emergency situation. Whether a facility has a single wall or numerous Acousti-Clear® movable walls, the Protector Series can be programmed for push-button activation for an individual wall or by a master control. With or without the MorphGlas™ feature, Acousti-Clear® Protector Series gives facility personnel peace of mind, knowing that complete sight line separation is just a simple push of a button away in an emergency situation. This is another reason why Acousti-Clear® movable walls are the clear choice for your next space division challenge. MorphGlas™, offered in 45 STC Acousti-Clear® Motorized single glass panels, have been thoroughly UL® tested and certified, a necessary specifiable feature for architects and interior designers in many projects. For more on Modernfold products and capabilities, visit https://www.modernfold.com. Modernfold is a part of the international dormakaba Group. For more than 94 years, Modernfold, Inc. has been the premier provider of products that enable optimal space utilization. Whether the primary requirement is acoustical control, versatile space management, energy savings, or daylighting, Modernfold’s innovative product solutions assist and facilitate building management. Beginning in 1925, the company helped invent the movable wall industry. Its current product line continues that leadership. In a wide range of installations, outstanding, highly flexible results are provided by Modernfold Operable Partitions, Movable Glass Walls, acoustically rated Acousti-Clear® Glass Wall systems, Acousti-Seal® Encore®, Acousti-Seal® Encore® Automated, Accordion Doors and now ComfortDrive®. Modernfold became part of the dormakaba Group in 2015. dormakaba Group offers innovative, reliable access, security, and space division solutions in corporate environments, hotels, shops, sports facilities, airports, and much more. dormakaba is one of the top three companies of access control and security solutions on the global market as well as one of the leading global companies in the space division industry. With strong brands in its portfolio, dormakaba and its numerous cooperation partners are represented in over 130 countries worldwide. The company has over 150 years of experience as a trusted partner for products, solutions and services for access to buildings and rooms from a single source. dormakaba is listed at the SIX Swiss exchange, is headquartered in Rümlang (Zurich/Switzerland) and generated a turnover of over CHF 2.8 billion with more than 16,000 employees in financial year 2017/18.